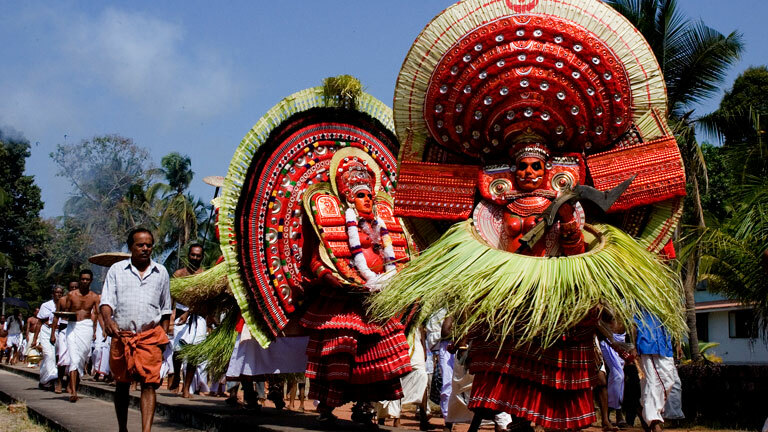 Theyyam is the popular ritual art form of Kolathunadu (Kingdom of Cannanore). The Theyyam dance is performed in front of the village shrine, groves, and in the houses as ancestor worship. The theyyam period is from the 10th of Malayalam month Thulam (October/November) and comes to a close by the end of June. Man assumes the form of God and dances propitiating and appeasing them and in return, the Gods assure prosperity and peace to society and is the belief behind the Theyyam performance. The performers of Theyyam belong to communities like Vannan, Malayan, Mavilan, Velan, Munnoottan, Anjunnoottan, Pulayar, Kopalar and others. Theyyam performance are followed many rituals. Initially, the performer is given an intimation and later that the date of performance is fixed and the performer (Kolakaran) is informed. The first part of the Theyyam performance is known as Vellattam or Thottam. Also known as Thottampattu, it is performed in a light manner without any elaborate costume and the performer narrates the origin and characteristics of different Theyyams. The Kolakaran along with his assistants participate in it. The main instruments used for thottampattu are Chenda, Veekan Chenda, Ilathalam and Kuzhal. For performing Vellattam, the performer's face of the performer is painted and he has a tuft of hair on his head. All the Theyyams will not have Vellattam instead they will have the function of receiving Podiyila. After the ritual song (thottam) is over, the Kolakaran appears on stage with proper make- up and costumes. There are different patterns of facial makeup. The colours used for the same is extracted from Nature like Chayilyam, Karimazhi, Aripodi and Maniyola. Depends on the nature of the Theyyam they will have different facial make-up, costumes and ornaments. Some Theyyams even bear fire on their hair like Theechamundi. Theyyams are performed in sacred groves and other places usually once in a year and is known as Kaliyattam. That which is performed after many years is known as Perumkaliyattam.